For most corporate marketers and brands, it’s that time of year again. The great reset of business objectives, marketing strategy and the alignment of marketing programs to both. At this point in the year (November), it’s even likely that you’ve been knee-deep in annual planning for a while now. Each year I run this very important exercise. Below are some thoughts around who to include in the process and when to include them by planning phase. Who to involve: In addition to the marketing team, it’s a good idea to include inputs and participation from a cross section of the business. This is good for two reasons. 1.) The broader team feels like they had a participation role, which helps to get the final product agreed to with consensus. 2.) You really will have a better overall plan when you have the proper inputs from across the business (when compared to building a plan in a vacuum). 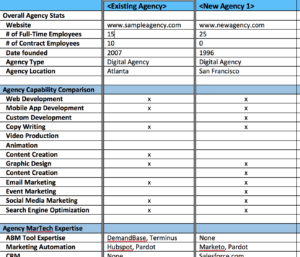 Should you include your agency during planning? In my experience, the answer is usually yes. That said, which stage you include them is dictated by the role your agency plays for your team. More on this in a few paragraphs. What are the most common annual planning phases? Below is what I’ve used in the past. 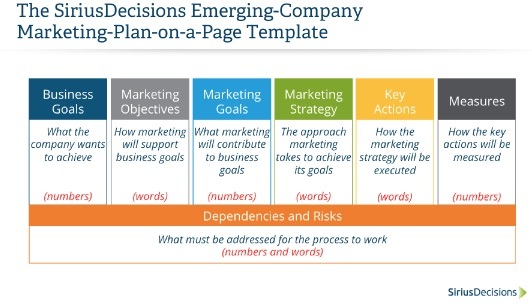 It tightly aligns to Sirius Decisions “Marketing Plan on a Page.” Note: This is meant to look at the highest level of planning. There are other spin-off stages and phases that drive deeper into the more tactical aspects. Looking at the phases, when is the best time to include the players mentioned above? Business Goals: Get the inputs from your sales leadership, and executive leadership teams. If you’re the top marketing person (or someone within proximity to that role), you’ve probably been involved in the overall business strategy work (hopefully done prior to this marketing exercise). Marketing Objectives: Sales leadership plays a critical part in this phase. This is where you’ll work with top sales execs to agree upon where marketing can have the largest impact to help the organization achieve the business goals. Marketing will gather inputs, dissect it, and then add their own two cents to the eventual output. In a perfect world, the sales and marketing leader(s) have strong alignment at this phase. In addition to sales, it’s a good idea to gather inputs from product or solution management at this phase. What are the products coming out this year, how do they need to be supported? How do they align to the business goals in place? Marketing Goals: Sales Operations / Marketing Operation will work in tandem to ensure that the KPIs / contributions to the business are aligned at this stage. Marketing Strategy: You’ve got the overall business, sales and operational inputs, now it’s time to apply them to a marketing strategy that helps you achieve them. This is a good place in include your top strategic marketing agency (if you have one). They’ll have an outside (and hopefully unbiased) view, which will be helpful during the strategy development process. Of course, you also want to include your senior marketing team members at this phase. Key Actions: Once the strategy is designed, now is a good time to include the more tactical marketing team members. In addition, you may want to pull in agency resources that are more “execution” in design – good example being your top digital marketing agency. The combination of players will be great resources to help brainstorm around initiatives or programs that need to come to life over the course of the year. Measurements: Once you’ve detailed the key actions and overall thematic elements (think large campaigns) that are output from the key actions phase, it’s time to tie it all back to the marketing goals in the form of Key Performance Indicators (KPIs). Once again, it’s a good idea to re-introduce the planning to the marketing and sales ops teams. They’ll be an important gut-check to making sure the numbers all tie off. Now of course planning does not stop here. You’ve got to build out campaigns, tactics, initiatives, develop budget, etc, etc, etc. However, you’d be surprised how often I’ve seen the basic phases above either rushed through, or not include the right players from a cross section of the business – which has potentially devastating consequences. In the end, make sure you have some structure to your annual marketing plan development process. In addition, make sure you have alignment, inputs and consensus to the final plan. These two things will be a tremendous aid in increasing the odds of success.